The sun shone for the ladies-only bike ride to commemorate the life of Horsham-born poet Shelley. 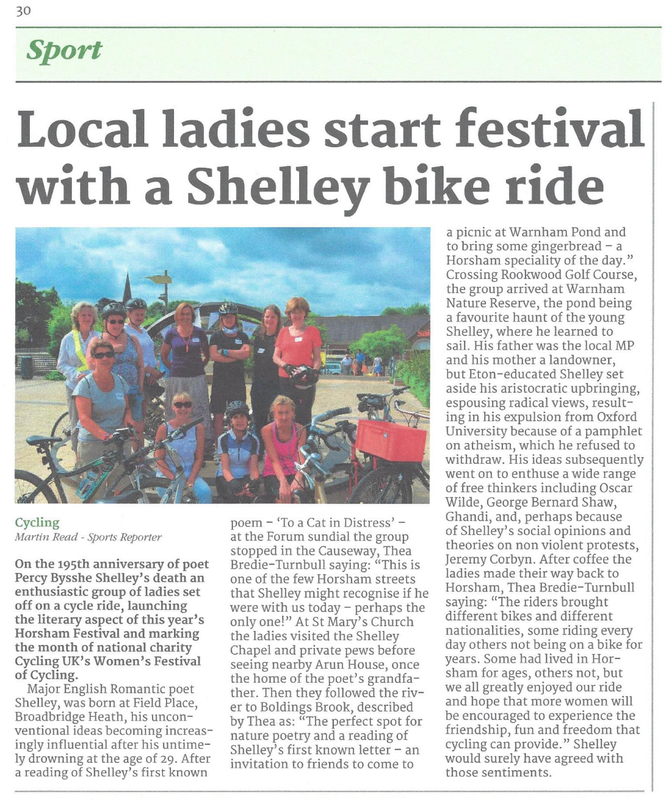 Event organiser Thea Bredie sent this report. At 10 am on Saturday 8th July 2017 a special small event kicked off the literary aspect of the Horsham Festival this year. 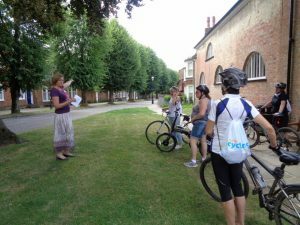 For the first time, 195 years after the poet’s death, P. B. Shelley’s early childhood was remembered in a newly-designed local bike ride. As July is also the month of Cycling UK’s Women’s Festival of Cycling the ride was only for women and it started with a complimentary Cycling UK “Goodie Bag” to welcome each rider. After a photo shoot and a quick bit of historical scene setting with the help of the Forum’s Sundial we read Shelley’s first known poem “To A Cat In Distress”. The first stop was the Causeway, one of the few streets (perhaps the only one) Shelley might recognise if he were with us today. We discussed the Shelley Tower, the Shelley Chapel and their private pews at St. Mary’s Church and – a bit further down the road – Shelley’s grandfather who once lived at Arun House. Then we found the river Arun and followed it and Boldings Brook until our next stop. 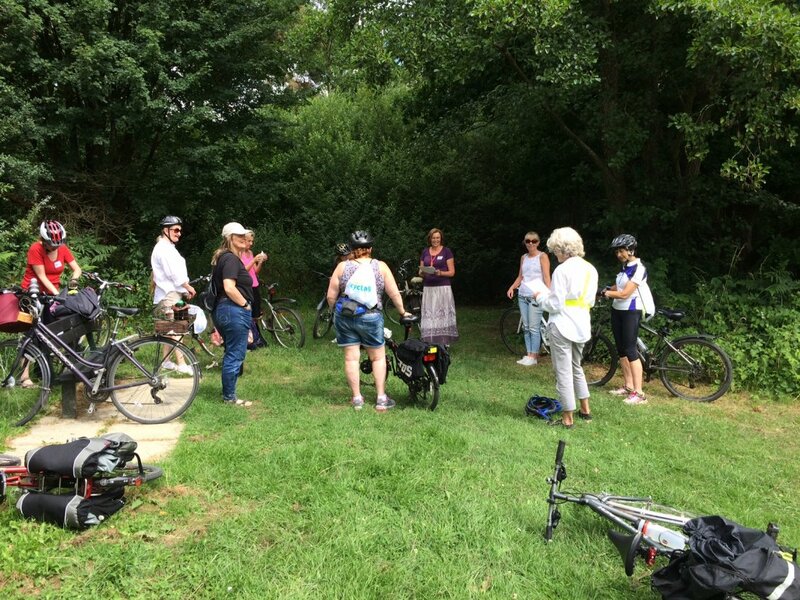 A quiet spot close to Boldings Brook was perfect for a nature poetry reading and then Shelley’s first known letter, an invitation to friends to come for a picnic at Warnham Pond and to bring some gingerbread, among other treats. The letter’s tone was that of a rather self-assured, spoilt perhaps, 10-year-old aristocrat. With the kind permission of Rookwood Golf Course we then traversed their grounds to reach Warnham Nature Reserve safely. The pond used to be a favourite haunt for the young Shelley, and the place where he learn to sail boats. A presentation over coffee and Horsham gingerbread went beyond Shelley’s idyllic childhood and featured Gandhi, Hardy, Mick Jagger and Jeremy Corbyn as some of those who were inspired by Shelley’s written word. 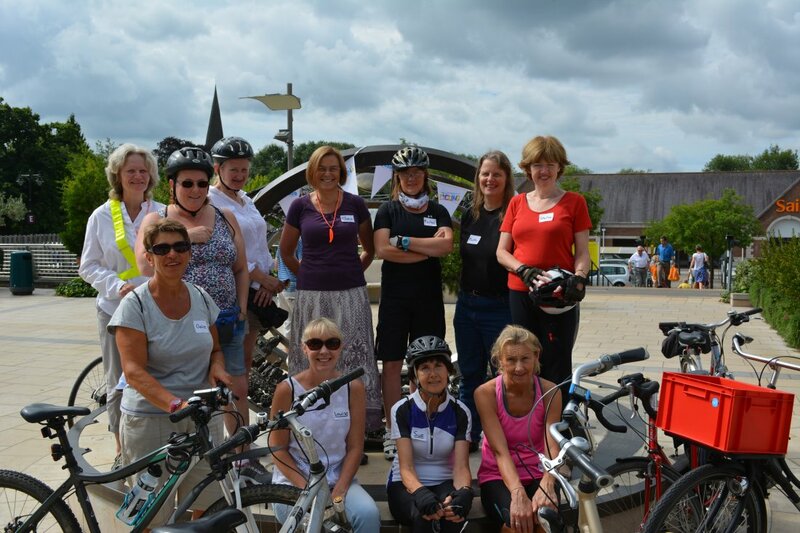 The eleven riders brought different bikes, different nationalities and different and levels of ability together. Some ride their bikes nearly every day, others hadn’t been on one for years. Some had lived in Horsham for a very long time, some only a few years and one had only just moved to Horsham. We all appreciated the lovely Riverside Walk. 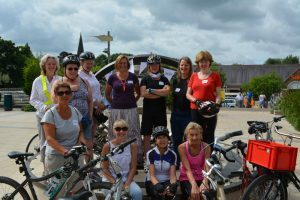 Sarah Nuttall, who inspired the creation of the bike ride, joined the team of 11 female riders before their departure home on day one of the Horsham Festival. An enjoyable morning was had by all. 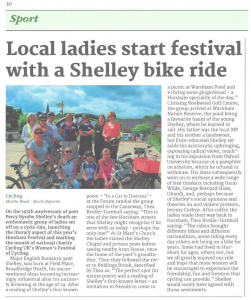 The ride was reported – in the Sport pages! – of the District Post.